A bunion is more than just a bump of bone on the side of the big toe joint. It is an abnormal position of the great toe joint. The diagram above shows the big toe turning towards the other toes, at the same time, the broader bone at the base of the big toe (metatarsal bone) is now being angulated away from the second metatarsal bone. 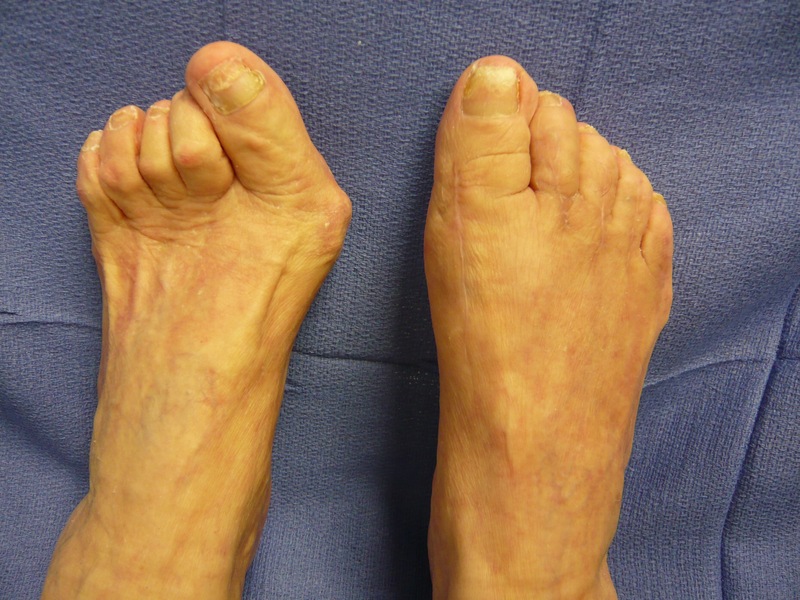 A more technical term for bunion deformity is Hallux Abducto Valgus. 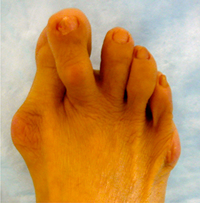 A bunion is most often a symptom of faulty mechanics of the foot. People with flat feet or low arches are more prone to develop the problem than those with higher arches. 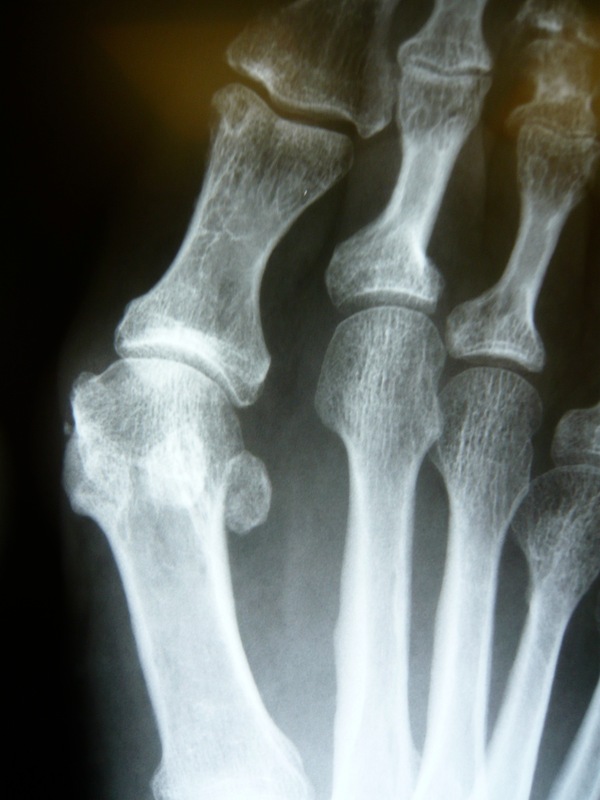 Bunions may also be associated with arthritis. Arthritis can cause the joints' protective covering, cartilage, to deteriorate, leaving the joint damaged with a decreased range of motion. Contrary to public opinion, bunions are not caused by improper shoes but by a combination of heredity and structural problems such as flat feet. What Does A Bunion Look Like? How Does It Feel? If your symptoms still continue, in person professional medical attention is needed. Generally, X rays will be obtained, most often in a weight bearing situation, and the degree of the deformity will be evaluated by the physician. 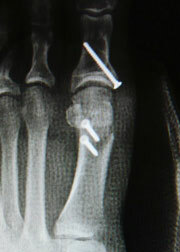 Note an Xray of a right bunion deformity to the right. Depending upon your medical evaluation, age, and activity level, a treatment plan will be designed. Sometimes oral anti inflammatory agents may be attempted, or injection therapy will be used, and possibly customized orthotic devices. These methods often help in reducing symptoms. In cases where symptoms continue and disability exists, surgical procedures are used to reduce the deformity and relieve the discomfort. f bone and realign the muscles, tendons and ligaments surrounding the joint-today this procedure is mostly combined with other procedures. For a moderate bunion, the surgeon may cut the bone, a procedure called an osteotomy, and shift it to its proper position. Whether or not the bone is cut depends on the severity and location of the deformity. In addition, the surrounding tendons and ligaments may need to be repositioned. This is probably the most common surgical procedure for bunion deformity. For a severe bunion, a combination of the following procedures may be necessary: removal of the enlarged portion of the bone; cutting and realignment of the bone; and correction of the tendons and ligaments. If the joint is partially destroyed (commonly seen in arthritis), it may need to be reconstructed or replaced with an artificial joint. 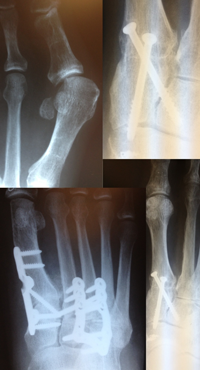 Joint replacement implants may be used in the reconstruction of the big toe joint. Other methods at this point include fusion of the joint-arthrodesis procedures. The pictures to the right demonstrate corrections that have involvrd the bunion as well as adjacent joint arthritis. Modern technological advancements have allowed these patients a faster recovery and a sooner return to their normal activities. Some risks when considering surgery include infection, joint stiffness, malalignment, joint pain, scar formation and recurrence. It is important for the patient to realize that these complications are rare, yet possible.